Last May, in my post Random Vs. Predictable, I waxed rather poetic on the challenge of writing books with predictable pov changes. That was all shot to hell in December. I began a new story that would not obey this stricture I had set for Vrythea’s (then Hatu Napor’s) stories. For starters, it has a whopping four (maybe even FIVE) points of view. That’s at least twice as many as I usually like to work with, but all of my pov characters have important parts to play in the story, and they won’t all always be in the same place. Even when they are in the same place, they won’t all be doing the same thing, or even at the same precise location. The plot is also slightly more complicated, at least in the beginning of the book/series. Degrees of Subtlety and Fairy-Touched are both much more straightforward, plotwise, than what I’ve got going in For Want of Impossible Things. In FWOIT, I’ll have pov characters wandering all over the landscape to accomplish the story. Also, of the possible five, four of these characters have a lot of growing and changing to do. One is arrogant and hidebound; one needs to come into his own power; another needs to grow up out of being a spoiled brat; and the fourth needs to learn the value of true friendship and how it can give him courage to do what he’d never contemplate on his own. They all need to learn to trust not only each other, but also themselves. I haven’t embarked on any stories this complicated in a long, long time. Quite frankly, I think I needed FWOIT to teach me an important lesson on working with the story, instead of trying to force it into some preconceived pattern. With that in mind, I intend to look at what I have of DoS and FT to see what, if anything, I’ve neglected to include in what I have of their narratives and their outlines. I think part of the reason why I’ve been stalled on those stories so long is because I’ve refused, point-blank, to see how loosening up about pov switches may help me progress on those stories. So, with the new year, I have a new mindset, one I hope will give me the ability to once again progress on all of Vrythea’s stories. Worldbuilding is something of a fluid process. Sometimes things happen which require changes to various worlds. Recently (like within the past week), I conceived of a new world with a new magical system, and I realized the world-name of Hatu Napor fit my new development much better. So, the world formerly known as Hatu Napor (where Degrees of Subtlety is set) will in future be known as Vrythea. To be honest, I never felt very confident the name Hatu Napor precisely fit that world, so I’m glad to have figured out where the name fits better. I don’t expect to be changing any other worlds’ names at all in future, so don’t worry I’ll start doing major overhauls of them. I don’t know how far this initial story for the new world I’m naming Hatu Napor will get, but I think it’s a trilogy. It’s a combination of new ideas, ideas borrowed from a friend’s concepts and twisted for my purposes, and resurrected worldbuilding from a fizzled-out project that never went anywhere and doesn’t actually fit the world I tried to place it on. When I began writing The Power of Music, I knew I would be working with two points of view. Throughout most of the first volume of that story, I managed to pretty predictably ping pong between the two. I’d write one or two scenes with Géta, then match that number with an equal number from Asthané’s point of view. There were a few places where I didn’t do that, but for the most part, I was able to keep that pattern. In the second book, that was blown all to hell. I’ve always seen TPOM more as Géta’s story—in fact, the whole Discordant Harmonies series. Asthané is an important point of view, but he’s not the most important one. It’s Géta. Don’t get me wrong. I love Asthané. He has a point of view because what he has to “say” is just as important, in some ways, as Géta has to say. They both have a major hand in the plot and making music for the Mages of the Empire what it’s supposed to become, not just in TPOM, but in the other two books as well. However, since Géta, as the musician, is pivotal to everything, the focus is primarily on his point of view. His scenes, and that meant I had to accept the fact that I could not tell the story I wanted if I kept up the equality ping pong between his pov and Asthané’s. So, in the second volume of TPOM, I wrote the story I wanted to tell. As a result, books two and three are pretty randomly divided between the two, with a greater number of scenes from Géta’s point of view. Asthané simply isn’t as influential on the story, and he has much less to go through with regards to plot. I think pretty much every Chraesti book which has two or more active points of view will fall out this way. These stories are my heart’s stories in a lot of ways, and I don’t want to screw with the technical side too much or they may not come out the way I want to—the way they need to in order for the whole saga I see for Chraest to work the way it has to. But my Hatuni books aren’t like that. It’s kind of an experiment what I’m doing with the books set on Hatu Napor. At least with Degrees of Subtlety (I) and Fairy-Touched. When I started outlining DoS, I determined I’d try to make the pov breaks as predictable as possible. They’re random in the extreme in TPOM—happen anywhere regardless of whether or not it’s actually a new chapter. With DoS, I wanted to challenge myself. 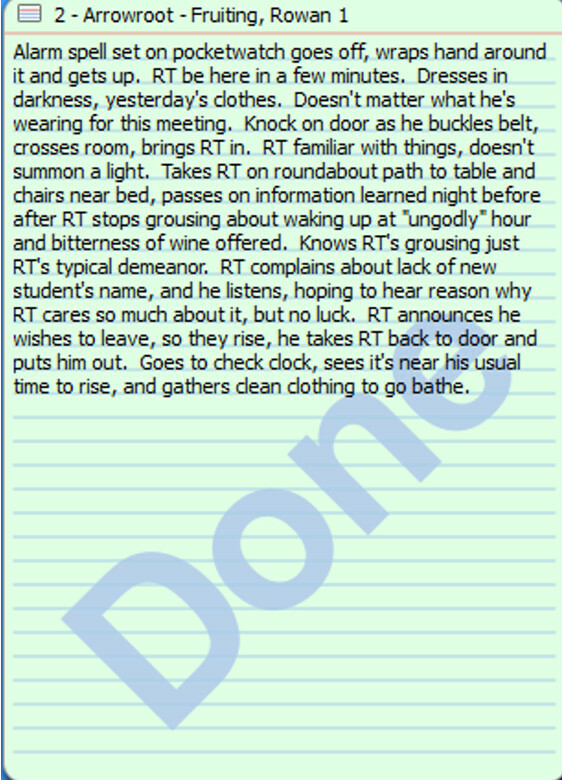 So, with that in mind, I outlined two scenes at a time for each character. DoS begins with two scenes from Arrowroot’s pov, then the chapter breaks, and the next two scenes are from Sweetbriar’s pov. Each character gets two scenes, and these two scenes comprise a single chapter told from that character’s pov. In Fairy-Touched, I have three scenes from each character’s pov in alternating chapters. So, one chapter of three scenes from POV1 (whose name keeps changing) in one chapter, and three scenes from Kaj’s pov in the following chapter. Thus far, I’ve been able to keep up with things like this without the story breaking down. I do not want to break this pattern with my Hatuni books. That’s part of the challenge. I want to see if it’s possible for me, someone who changes point of view arbitrarily, to create a comprehensible story which is logical and makes sense plotwise while keeping to a strict, predictable pattern. I also want my Hatuni books to be stylistically different from my Chraesti stories somehow. I want them to have their own “personality.” Making the point of view changes predictable is the best way I could think of to do it. Dividing the pov changes by chapter makes them even more distinct from my Chraesti books. I’ve found my Hatuni books require a different mindset. In order to create the divisions between points of view I have in them, I spend longer trying to see pertinent scenes. But the challenge is fun, even if it’s slow-going with them. I’m finding myself able to write deeper scenes than I think I’d be getting on them if I were randomly changing points of view. Writing more than one scene from one pov is also allowing me to deepen their characterization over a longer “period” in the story. I’m also able to focus on plot points better, which means I see more things I can do to add depth and complication to them. Staying in one point of view throughout a chapter also enables me to give both characters “equal” page time, relatively speaking. They’re turning out to be “neater” books—no matter how much I love them, I’m always going to see my Chraesti duo/multi pov books as “messy.” No rhyme or reason to the randomness of their pov switches aside from the plot requirements. I’m finding I enjoy creating predictable pov switches in my Hatuni books. I’m excited by the difference in the style, and it makes the books challenging enough to plot out that I haven’t lost interest. I didn’t originally intend to work on Degrees of Subtlety—or on any story set on Hatu Napor at all. My intent was to focus solely on Chraest, where I have the most stories set. It’s still my goal to get 12 Chraesti stories done before I start publishing, in fact. But Hatu Napor isn’t the only world I’ve previously created and then “abandoned.” There are several others. And they all have stories which fascinate me attached to them. Stories I long to work on, which I’d love to complete. For instance, there’s Married to the Moons, a trilogy (I hope), and other stories set on Nahela. The primary MC for MttM is a suicidal Voice of the Gods. The Moons he’s married to? The three Sister-Goddesses who direct life in his homeland. I need to do more backstory and worldbuilding on Nahela before I can decide precisely what to do with it, but the “introductory” story, MttM, is still very dear to me, and I’d love to complete it. Then, on Tzefanya, I have Seeking Knowledge. I’m waiting on my subconscious to provide vital bits of information regarding the storyline, various religious facts about the world’s current state, and more of the backstory/history of the Ahlai, a nomadic people who were forced to abandon their homeland to avoid being enslaved by an invading empire. And I have Ferodoxis. That’s not it’s real name, that’s what the humans call it. For the natives, at least those in Imotina, it’s Ferodozhe. Don’t ask my why the humans screwed it up like they did, my creative mind hasn’t told me yet. On this world, in Imotina, is set a story about one of the very few—well, she’s not precisely straight, though she marries a male of her race—female POV MCs I’ve ever been able to make real. I hope to get back to The Obscure Child and its following books (whose series title I don’t yet know) at some point in the future. Just . . . not right now (hear that, creative mind?). And then there’s Mistworld, or Elindu. A continent surrounded by a curtain of mists and referred to by its denizens as the Heartland is a kind of dumping ground of various races from elsewhere on the planet. Outside the mists, in the majority of the world, magic is something if one is lucky one is only deported to “the Mists” for having. If one is not lucky, one is consigned to one of a number of torturous deaths. Technology reigns beyond the mists, but within them, magic is paramount. This world has elves of various types, possibly vampires (some worldbuilding I haven’t quite decided upon), and the auspices of various gods who have been forgotten by those outside the Mists. Farrillan’s story, in Cat Eyes, is set on this world. I’ve written one other story, a novelette, set in the Heartland. Not sure what kind of tech I’ll be giving the people outside of the mists; I’m having enough trouble figuring out the Heartland as it is. Last, but not least, are my Urban Fantasy stories. I’d love to get these going again, but I’m not ready to do the research necessary for them. I’m also not certain if I want to have my UF Earth tied to Elindu in some way, and if so, how strong that tie should be (for instance, can people pass between them easily, or are there certain requirements or restrictions which make doing so too costly? What would be the effect of tech in the confines of the Mists on Elindu? How long have they been connected, how did they come to be so, and did Earth give Elindu magic, or was it the other way around?). Lots to work on with this yet. Luckily (for me), my creative mind hasn’t splintered off into offering profound Must Write NOW ideas for any of these other projects. And I hope it doesn’t happen until I’ve finished at least the books for Chraest I want to write for my first year of publishing (at one book a month, if all goes well). I do want to get back to these worlds and their projects. Not right now, though. I have enough to work on as it is just with Chraest, never mind Hatu Napor. A fair number of the writers I know from Forward Motion for Writers create and use music to help them focus on their stories. One I’m close to (as close as one can get over the net) uses Techno blasted at incredibly loud levels to unhook her mind enough to be able to write. Another creates playlists whose songs either match the “epic” feel of what she’s writing, or specific character emotions and the plot. Occasionally, I’ll use one song to help me focus on a story or project. For instance, recently, I’ve been listening to “Somewhere Only We Know” by Keane to help me write scenes in Degrees of Subtlety. Don’t know why this song is working for me, but it works a lot better than the rest of the playlist it’s from at present, and has been for the past week or so. It doesn’t have any tie to a particular plot point or scene, though it does reflect Arrowroot’s feelings, particularly once he’s separated from Sweetbriar; it seems to be a song which describes regrets and a longing for an earlier time, and though he’s firm on his “need” to be away from Sweetbriar, Arrowroot does nurse these emotions. On the other hand, when I get ready to read through anything in the Discordant Harmonies series or to do anything related to it, in fact, I’ll put on the full playlist. Recently, I’ve been opening this list and manually selecting the first song to play, which has typically been “Stairway To Heaven” by Led Zeppelin. The only relation to anything in this story the song has is the fact Géta’s father, who is on his deathbed, tithes Géta to the Temple. That’s all. However, the mood of the song is what induces me to play this one first, because so much of Géta’s life as Asthané’s musician rides on the fact he has no choice in his status. Yes, he could have chosen not to accompany Asthané—but at the cost of something he loves dearly, something which gives him peace, comfort, and happiness and which he has always dreamed of pursuing. Another song from this playlist, which I listen to before going to sleep at night, is “Follow You Follow Me” by Genesis. This epitomizes in a lot of ways the way Géta comes to feel for Asthané, particularly in the later books I have planned for this set of books. I don’t listen to “Stairway To Heaven” primarily because the volume of the song fluctuates too much for me to find a comfortable listening level where I can hear all the lyrics without half of them blasting my ears out—something I definitely don’t need when I’m trying to relax before falling asleep. I typically acquire my story/series specific playlists by turning on my Daily playlist (the one without Christmas music), and announcing to myself I’m listening for songs which seem to fit a specific story. I did this to find the songs which seemed to fit DoS a few weeks ago, when I returned to working on it. The playlist I had at the time for it consisted of fewer than ten songs (I think only about half a dozen, in fact) and some didn’t really fit as I now saw the story. I removed those songs from the list, put on my Daily list, and listened to the randomized music until I finally had a playlist of over ten songs for the story. I have, once, gone through my Daily playlist with a deliberate intent to hunt out the songs which I thought might best fit a story. I did this for Unwritten Letters. And I found plenty of songs which fit the story. Unfortunately, it wasn’t the best solution to finding a playlist. I detested the playlist for the first week I listened to it, but my creative mind refused to work on UL unless I was listening to it, so I couldn’t avoid it. This was not a pleasant experience, though it did not turn me off the story or the music. I did eventually come to like the playlist, but I don’t intend to ever go through my Daily list on a deliberate hunt for songs; I’m much more comfortable with the playlists I develop with my standard “notify subconscious of search” and random play method. 1. “Baby Come Back” by Player – Doéna develops a romantic relationship with another character, and it ends badly; this song describes how they both feel about their separation afterward. 2. “Ballare” by Cirque Du Soleil – Essentially represents how Doéna’s romantic interest feels about him. 3. “Don’t Go Breaking My Heart” by Elton John and Kiki Dee – Pretty much every prominent relationship in the story. 4. “Hope Has A Place” by Enya – Why Doéna doesn’t give up on anything until absolutely forced to. 5. “Hopelessly Devoted To You” as performed by Olivia Newton-John – Doéna’s conflicting feelings for his prince and his romantic interest. 6. “I Melt With You” by Modern English – How Doéna feels about his romantic interest. 7. “I Want Your Love” by Chic – The reaction Doéna’s love interest has to Doéna’s unswerving loyalty to his prince. 8. “Joanna” by Kool & the Gang – It’s an ode, and if nothing else, Doéna’s love interest is sappy over him unless they are disagreeing on his loyalty to Lorien. 9. “Lost In Love” by Air Supply – Doéna and his love interest . . . when they aren’t disagreeing over Doéna’s loyalty to his prince. 10. “Misery” by Maroon 5 – Lorien’s relationship with Necée; how Doéna feels about his separation from his love interest and, at the beginning, about his unwelcome feelings for his prince. 11. “Missing You” John Waite – How Doéna feels after he and his love interest break up. 12. “Moondance” by Van Morrison – Mood, something which hit the heart of the relationship between Doéna and his love interest—the simplicity their relationship could have had if they hadn’t been at odds over Doéna’s loyalty to Lorien. 13. “One Of These Nights” by Eagles – Doéna’s hopes for all the conflict in his life to settle favorably for himself. 14. “River” by Sarah McLachlan – Doéna’s despair when everything goes badly. 15. “So She Dances” by Josh Groban – How Doéna’s love interest feels about him. 16. “Somebody’s Baby” by Jackson Browne – More of how Doéna’s love interest feels about him. 17. “Still Loving You” by Scorpions – The lingering feelings Doéna and his love interest have for each other after the fallout which separates them. 18. “Suddenly” by Billy Ocean – Apt characterization of the way the relationship between Doéna and his love interest begins. 19. “Take My Breath Away” by Berlin – How Doéna feels about, at first, his prince, then, later, his love interest. 20. “Tender Is The Night” by Jackson Browne – Mood, pretty much fits how Doéna feels about Lorien at first and his love interest later. 21. “Walking On Sunshine” by Katrina & the Waves – Doéna’s moments of joy, when things are going well between himself and Lorien or himself and his love interest. 22. “When It’s Love” by Van Halen – Mood, Doéna’s sappiness over, at first his prince, then, later, his love interest. Now, if you’re still with me (LOL), I’ll add a bit more. The more songs I can fit to a particular story, the better my focus on the story. It sometimes bothers me I have so many relationship-oriented songs in my story playlists (this is typical of all of them thus far), but I find I’m better able to concentrate with longer lists, so I try not to fight my discomfort too much. Usually, I find when I start a playlist and get into a scene, the act of writing enables me to focus past any discomfort I may be feeling, which is part of why UL’s playlist worked so well despite me detesting it for the first week or so after creating it. Sometimes I can listen to my Daily playlist, but that’s rare. The utter randomness of the songs which can go from Enya to Ozzy Osbourne to Danny Elfman breaks into my concentration too much. I’m also for the most part mainstream in my music selection. This is not because I’m afraid of stretching my music tastes, but purely because what little time I spend hunting out “fresh” music to add to my Daily playlist is still, even after years, focused on finding music I’m already familiar with in some way. I’m always happy to find new songs I like to add to my music collection; I simply haven’t found the time or attention necessary for finding them unless I’m passively listening to the radio in a friend’s car or while I’m showering (both methods being the ways I discovered any of the more “recent” songs on my example playlist or mentioned in this post). I’m going to tag this under “Why Do I Do Things Like This To Myself?” Really. Because that’s the question I’m asking myself right now. It’s the question I’ve been asking myself since picking up Degrees of Subtlety again. I was not taking into consideration my subconscious mind’s propensity for slamming me with new and varied characters, stories, and worldbuilding facts. My . . . . uncertainty? Fear? Stark raving lunacy? Whatever it was, it began when I picked up DoS and restarted it. I did this without first seeking out the writing log for the original version. All I had was the original version of the story, and I thought, in my innocence, I wouldn’t have any problems simply lifting names for the various characters who were to appear from this. I’d forgotten one extremely important fact about the original version of DoS. This fact? It was incomplete. One lesser, but equally important fact, was that I hadn’t given all the Wizards whom I expected to play roles names yet. So I blithely restarted the WIP, thinking I was all set with just the incomplete original story. About the time I got to the third scene, which is the first from Sweetbriar’s POV, I realized my mistake. At this time, I made a frantic search, certain I recalled a vast list of names, including some already attached to various characters in the original version, on the back of the logsheet. I looked everywhere. Could not find it. Continued writing, ’cause the story had gripped me. Finally found the logsheet in a spot I hadn’t looked—a nesting stack of sorting trays—they nest or “spoon” together if you don’t stack them properly, which makes them nice for moving. Anyway, I found the logsheet, flipped it over, and . . . found a piddly list of names in the upper-left-hand corner. Maybe half a dozen or so. Certainly not enough to supply the number of characters who I could now successfully envision populating the microcosm of the Government-Funded Wizards’ School in Revustere. I thought, “Okay, so it’s not here, but I clearly remember making a larger list than this.” So duly searched again a couple weeks later, during an energetic day in the middle of radiation treatments. No luck. Finished the search with a much-neatened desk and a serious case of the confoundeds, because I could not imagine where I’d put that page with the list of names. It had been at least a year and nine months since I’d last tried writing on the original version, and, at the time, though certainly inspired, my heart definitely hadn’t been in it, because what I had in it was definitely lacking in a lot of important ways. I was not discouraged, though I had reached the point where I was beginning to wonder why I did this stuff to myself. I can be clever with my writing, and make sensible decisions regarding plot. Consistently coming up with names like Razorthorn, Arrowroot, Shadowshale, and Yellowcliff, however? Not quite so easy. I distinctly recall having asked for assistance with this naming convention before, with the original story, because I was enamored enough of it I hadn’t been able to convince myself to go without it, and of course I felt that way now. There are some things my subconscious, especially with regards to worldbuilding, will not give up on, and this was one such aspect, and I knew, though it seemed small, inconsequential, and thus something I should easily be able to change, my subconscious had an excellent plot- or worldbuilding-related reason for clinging to this naming convention. So, there is a reason why I do these things to myself. I just don’t know the reason at first. Having requested help previously, back in 2012, when I first conceived of this story, I knew it wouldn’t be an issue to ask it again. So I did. And this time received, like a shaft of light through clouds, something which could consistently help me. A link to a site which generates many things, from character names to, well, I can’t recall off the top of my head, but was certain to be a boon. I went there, ordered up some wild elf names, and . . . mixed and matched the components to create names which were at least halfway decent and sounded like the kinds of names male mages would pick for themselves, though none were as ominous as Razorthorn happened to be (and which I considered one of my more clever names in DoS; second would be the names of the twins Shadowshale and Nightstone—because I wanted names with similar components). In case you couldn’t tell by now, I’m not much good with creating names for characters if they need to have specific components which have nothing to do with an alphabet I created. I do a little better on straight made-up names using the English alphabet, even if I don’t create a specific alphabet for them. The names of all my mundane characters on Hatu Napor are such names, and they come from me combining some words, mangling others, collecting obscure and/or foreign names from real-earth name lists and altering them enough to be fantasy names, and pulling them out of the air at need. With this type of naming, I’ve had years of practice, and I do even better if I have a firm alphabetical system to fit them into. But names like Razorthorn, Yellowcliff, and Arrowroot? My mind freezes. And, worse, I decided the fairies had nature-oriented names. But I can’t let these nature-oriented names go, because I now know the reason why Wizards take them. It is, for the Wizards, one of the very few things they have left of the Old Ways of fairy-gifted magic. And the fairies have nature-oriented names because they always have. When they were first created, the ones who created them – mortals with the gift of manipulating nature itself, who adopted nature-oriented names as part of a rite of passage into their full power – gave fairies nature-oriented names. So, even after fairies could reproduce on their own, they adopted on their own or were bestowed by other fairies nature-oriented names. So, I’m stuck with this naming convention, but at the same time absolutely love it – because of the worldbuilding behind it. And the worldbuilding, my friends, makes all this struggle worthwhile. I used to “pants” (write without planning) every story. I didn’t complete many stories that way. It didn’t matter how long the story was supposed to be; most of mine are longer than the SFWA definition of 7,500 words, for a short. I write novelettes, novellas, and novels. Mostly novels. And most of them are beyond 40,000 words. I’d frequently hit the halfway point (40k-60k) and fizzle out between there and the three-quarter mark. Because the ideas would fizzle out, and the stress of need another scene to write would block me to the point of abandoning the story. Then I started reverse outlining incomplete stories I most wanted to complete. Reverse outline cards typically consist of a one or two-sentence summary of the written scene. When I reached the end of the written-out scenes, I’d traditionally outline (do the plot cards before writing the scenes) the rest of the story. I completed a few stories this way. There were also a couple of stories which I started and abandoned, but which needed full rewrites. Most of the time they had plotting issues. Events happening out of order, periods in the project where I focused on one subplot to the exclusion of every other plot, including the primary one. Stuff like that. These I entirely outlined prior to writing them, and I completed the rewrites. I know now I was able to complete these outlines before writing the stories because I already had almost the entire stories written in some form prior to reorganizing the plot to be workable. Then I started outlining stories before or as I wrote them. So, I may start, get two scenes; these I’d reverse outline, then add two or three fresh plot cards before writing one scene. Outlines I started before writing began with that pattern. Two or three plot cards per scene written. I completed more stories this way. When plotting is going well, I find I’m most comfortable working plot cards about ten or twenty cards “ahead” of where I’m writing the scenes from the cards already done. This has been hard to accept, because I’ve been, of course, trying to cling to the RULE that The Outline Must Be Complete Before Beginning Writing. But I reach a certain point in my fresh stories—my speculative fiction stories—where I hit a block in the outline. Usually this block harks back to an earlier point in the outline, and involves an aspect of the story which my subconscious hasn’t presented to my conscious mind. The best way for me to unlock these plot points, I’ve found, is to write out the earlier scene. That’s all I had on the sweetheart until I included the first scene with Karé, the story’s antagonist, who plots to destroy Lorien’s faith in love and happiness—and Lorien’s standing in Imperial Court. I had no idea just what he’d mean to the story until the moment he introduced himself, and I wouldn’t have had that without first writing the previous scenes out. In writing those scenes out, I learned of the Éecinis, Doéna’s status and standing in the Vénari Court, and the pitfalls he expected in the Imperial Court. Without those, I’d have had nothing to write after the point where Lorien and Doéna arrive at the Imperial Court, at which point I’d have hit my block and been unable to write past if I’d been pantsing the story. The scenes I’d written gave me the basis for Karé’s presence and conniving nature. “2” indicates which plot card this is, which is the second scene in the story. “Arrowroot” is the Point of View character; this story alternates between his and Sweetbriar’s points of view. The “date” is “Fruiting, Rowan 1,” which is the name of the month, day of the week, and which week. I’ve determined, much to my discomfort, the people of Hatu Napor have a 364-day year divided into 13 months of 28 days apiece. Those in the area of the world where Sweetbriar and Arrowroot live have named the months after various natural events which occur throughout the year, and the days after trees to be found in various locales. No year date yet because I haven’t worked out the year-dating system yet, at least not for this hemisphere. I suspect I’ll use something the whole world adheres to, which will most likely have to do with either the appearance or disappearance of the fairies; both events are rather prominent. The scene summarized includes the snippet I have on DoS’s page. As you can see if you compare the card to the snippet, I didn’t write the scene exactly as described in the card. This was another thing I had to learn, that the scene did not necessarily have to follow the card precisely. Allowing such flexibility enables me to come up with workable scenes which do their jobs. I’ve gotten so flexible I don’t even care if a scene I write matches the plot card which was supposed to inspire it any at all. What I usually write in those unexpected scenes generally serves the story much better than what I’d planned in the plot card. And, if I need, I can later plumb the card for any plot-pertinent info to include in later cards I haven’t yet written. It bothers me that I’m not completing the outlines before I write the stories, but this is the way my mind works, and, I’ve discovered, I have a tendency to get blocked on plot cards if I’m not writing earlier scenes out. This is why I write ten-to-twenty plot cards ahead of where I’m writing out the scenes. Frequently, I’ll get one or two plot cards and be unable to see just what should happen next. Sometimes letting things percolate in the back of my mind works for moving past such blocks, but more often, I find that if I write out an earlier scene and read through the plot cards between it and the point where I stopped, I’ll come up with a decent idea much, much sooner, and the idea will be much stronger than it would have been if I’d forced myself to outline past the point of when I felt I had to stop. I occasionally use other methods of plotting, but I won’t go into them here. This post was about my basic Everything Is Going Well plotting method. Last year, following one of my writing dowswings, I came back to writing with a mind focused on gay romances. I fought this for about a week, then fiddled with it, and, eventually, picked up my fantasy work again. Right now, I want to say I’m out of this most recent writing downswing, but it ended just about the same time my radiation treatments began and they’ve kind of eaten my writing mind. But I’m going with the flow. Part of this means when I do write or work on my writing, I don’t force myself to focus on Chraest’s projects, much as I’d rather be working on them. I’ll be honest and admit I wasn’t happy to come back to writing focused on Hatu Napor’s initial project. I’d decided to let it set until I was done getting my year’s-worth of Chraest’s books done first. However, sometimes my muse throws me curveballs like that. And the reason why I went with it, instead of forcing myself to work on Chraest’s projects? I really don’t want to make myself depressed. Because, when I force myself to work on something my writing mind isn’t focused on, I don’t make any progress at all on anything, and I drive myself into a moody, bitchy, depressive mood swing, which just exacerbates everything. I’m not a nice person when I’m like that, to myself or anybody else. It’s not a fun experience at any time, and I’m a firm believer in the philosophy that writing should be fun. It’s not fun to try and force my creative mind to do something it doesn’t want to. And even with that, I’ve been happier with this focus than I was any time from 2009 through 2012. Because I’d come out of my downswing focused on the genre I want to write. And this focus hasn’t lasted long. About two weeks. Last night and the night before, I opened various Chraest projects. I’m reading through them, refamiliarizing myself with the stories, characters, and world. More because of the length of time I’ve been away from them (Eight weeks! Yikes!) than because of anything else. I’m starting to feel excited about working on stuff set on Chraest again. So I’ll keep going with the flow and see where it leads. In each of my minor downswings last year, I was creative. I also came out of them focused on Chraesti stories. I had other worlds I’d written stories in, with other magic systems, in various states of worldbuilding, but nothing about them called out to me. I even dropped the one non-Chraesti project I’d been working on for the Two-Year Novel Course, Degrees of Subtlety. This time, when my writing mind fully surfaced for more than a gasp of air, I found myself focused on this project and world. I was not expecting this at all. The writing urge has tapered off (likely due to the new phase of cancer treatment, which I’ll blog about later), but I spent a number of days last week writing on DoS and worldbuilding for it. Then I got the concept and basic storyline for another story set in that world. Unlike Chraest’s stories and worldbuilding, this other world, which I’ve tentatively named Hatu Napor (one guess about where I got the first half of the name), is pure fantasy. No history of spacefaring humans, no alien species and backstory relating the humans’ current situation. Hatu Napor isn’t the only pure-fantasy world I’ve got which my writing mind could conceivably have decided to focus on. I have one which is tied to our world through places like the Bermuda Triangle; this I’ve called Elindu, and it has vampires, dragons, and a small variety of elven races. There’s also Nahela, where all mages have twins, and all true priests, whether they adhere to a religious philosophy or not, have more than one soul. But this time, the Muse decided to remind me of my characters Sweetbriar and Arrowroot and their story. It’s been fun working on Hatu Napor and this story and the new idea. They’re markedly different from my Chraesti stories, which makes working on them a nice break. For one, while Chraest’s humans are in a verge-of-industrialization-level society, Hatu Napor has passed that point to some extent. Electricity is present. New weapons are being developed (guns), the automobile has recently been invented and is attainable by those of some financial prominence, though they aren’t exactly reliable. They have factories, and different religious factions vie for prominence. Where in Chraest’s stories homosexuality is almost universally accepted to some extent, in Hatu Napor, or at least the country where these two stories occur, it isn’t quite as welcome. It’s definitely a nice change. I’ve restarted DoS and am about four or five chapters in. It’s been a fun rewrite. The original partial manuscript left much to be desired in plotting and characterization, and I’ve been able to make both a bit more complicated this time around. I’m right now doing one or two plot cards per scene written on it while I work on the outline for the other story set in the same country/world. I’m experimenting with this a bit, too: doing two scenes per chapter from one character’s point of view before switching pov for the next chapter. So far, it’s working out well, and I’m going to try the same thing with the other story, only it looks, so far, as if I’ll be doing three scenes per chapter in it. It’s also a nice challenge. All in all, I’m glad I came out of my most recent downswing with a focus on my fantasy work, even if it isn’t what I’d anticipated working on. It’s proved to be challenging, fun, and a nice break from the intensity of some of my other fantasy work. I also look forward to seeing what other ideas I come up with for Hatu Napor. I’m sure they’ll be just as fun to work on.